Whitney Shouse and Sam Fogleman act out a scene from “Amateurs” during rehearsal. Off-Main Street Players will perform the Tom Griffin comedy from Friday, June 7, through Saturday, June 15. The show is set at the opening night cast party for a community theatre production and contains a hilarious and heartbreaking cast of characters, including a newly divorced high school teacher who fancies himself a great ventriloquist, a Hollywood starlet wannabe, and a well-known drama critic who has agreed to review the play. When the critic has a heart attack and leaves his not-yet-published review behind at the party, the actors in the show are forced to confront their real talents, hopes and dreams. 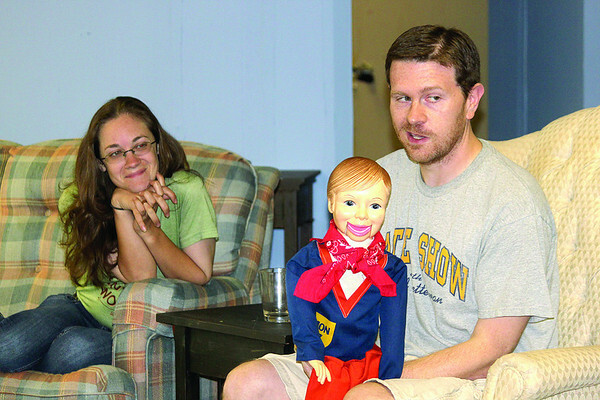 Written by the author of the well-known play “The Boys Next Door,” the show is fun for community theatre actors and audiences alike. Evening performances are at 8 p.m. Fridays, June 7 and 14, and Saturdays, June 8 and 15. A matinée will be at 2:30 p.m. Sunday, June 9. All performances will be at Town Hall, 1100 W. Oak St. Tickets are $12 and are available at the venue, by calling 595-3700 or visiting http://www.offmainstreetplayers.org.